Nachos…..the good for you kind. 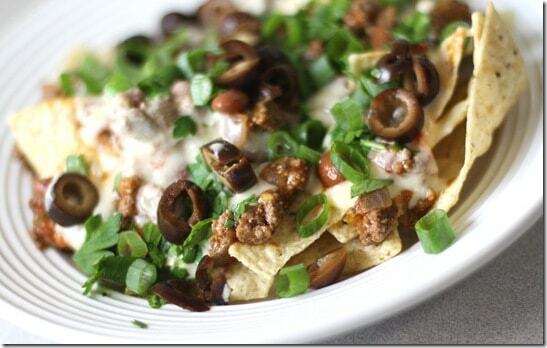 I love nachos! But I’m spoiled on the kind I make so now I don’t even try the restaurant ones. I modified this from a Rachel Ray recipe to lighten up the fat and sodium, but still full of flavor. 1 jalepeno, chopped with seeds discarded unless you want a LOT of heat. The heat is in the seeds. spices: chili powder, cumin, red pepper, salt. Adjust accordingly. Brown the beef, onions, garlic, jalepeno. Add cans of beans and tomatoes and spices. Let simmer while making cheese sauce and toppings. add 2 cups of skim milk. As this thickens, add more milk if needed until desired consistency. 1/2 cup of shredded reduced fat sharp cheese. Melt in white sauce on low heat for 2 minutes. Layer tortilla chips on plate. Previous Post: « Breakfast for the First Day of School! !